This holiday season, instead of gathering around the piano for traditional sing-alongs, some families will gather around their television sets and game consoles to make music — by playing games like Guitar Hero and Rock Band. Now, there’s a new option for these digital performers: Wii Music from Nintendo. This $50 game was designed for Nintendo’s hugely popular $250 Wii gaming system, of which there were more than two million sold in November alone, according to the company. 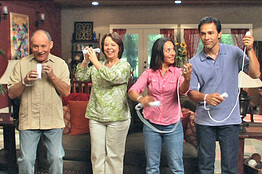 Wii uses motion-sensitive controllers to move characters in games. A game of tennis in Wii Sports, for example, works when you swing the Wii remote like you would a tennis racket. The Wii’s simple graphics and adorable Miis (on-screen cartoons designed to look like you) appeal to the non-gaming set, inciting parents to challenge their kids to games of Wii Golf and spurring senior centers to start Wii Bowling leagues. People playing Wii Music use the remote as a musical instrument. Nintendo carries this cutesy, user-friendly style of video gaming over to Wii Music, where the remote works as a musical instrument, cheerful songs abound and a white-wigged character named Sebastian Tute gives instructions. Along with Sebastian, the Tutes — a musically gifted group of Miis that would give the Von Trapps a run for their money — appear and demonstrate how to play various types of music and instruments. Though it’s comparably priced, Wii Music differs from games like Guitar Hero and Rock Band in many ways, and there are understandable reasons why a frequent user of those games would shun Sebastian and the Tutes. For starters, teenage fans of Guitar Hero and Rock Band who like the games’ variety of popular songs may gripe about Wii Music’s selection, which includes the likes of “My Grandfather’s Clock” and Beethoven’s “Ode to Joy”; none of Wii Music’s songs are more recent than the late 1980s. Perhaps the biggest difference is that, in Wii Music, you aren’t using a few fake instruments like a guitar or drum set. You are instead manipulating the Wii controller to simulate one of many instruments depicted on screen. There’s even one “instrument” called Dog Suit — a dog suit that, when worn by a Mii, uses canine barks in place of notes. Another key difference is that, aside from one game, Wii never penalizes you for playing an incorrect note in a song, because you can’t play a bad note — every press of an imaginary key or strum of an invisible string plays the correct note. 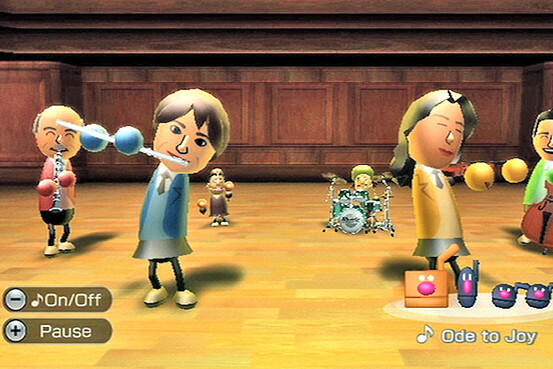 A musically gifted group of Miis — on-screen personas representing players — demonstrate how to play various types of music and instruments. This “no mistakes” environment is a little bit like a sports league in which every kid gets a trophy. Wii Music got a bit too saccharine at times, like when I scored a lousy 43 out of 100 points in a game and Sebastian Tute assured me that points didn’t much matter so long as I played the way I wanted to play. But for people who are learning about music and don’t want to worry so much about playing the right note, OK: Wii Music fosters a freedom to experiment with style by allowing users to improvise and explore variations of songs. Outside of the Games section, you are the judge of your own performance, rating it however you see fit, or not at all. Wii Music is divided into Jam, Lessons, Videos and Games. My favorite section was Games, which included conducting a song in Mii Maestro, hitting the right note at just the right moment in Handbell Harmony and arranging Miis from lowest to highest note in Pitch Perfect. The more activities I completed, the more instruments and songs were unlocked and available for me to use; off the shelf, each copy of Wii Music starts out with 27 instruments, but over 60 can be unlocked in the game. In Lessons, Sebastian Tute explained the importance of each instrument in a song and the role that it played. Before I played drums in a reggae song, he explained that reggae drums lay down an eight-beat rhythm. In the Japanese style of music, I learned how to play and recorded myself playing all four parts of a song: taiko drum, bells, shamisen, a three-string guitar-like instrument that puts bass in the song, and flute. If you’d like, you can opt to save your performances as music videos when you’re finished. These include your mistakes — err, improvisations — and some other funny effects like views of the audience members as they bob their heads listening to you play “Twinkle, Twinkle, Little Star.” Album covers can be made for these videos, and the finished product can be sent to other friends’ Wiis if they also have Wii Music. Those friends can play over parts of your song and send the revised video back to you. While you’re playing songs, small black notes with faces on them called Be-Bops appear in the bottom right of the screen and work as a metronome would, steadily keeping the beat. But cool accessories like guitars and microphones that are used to play music with other games aren’t available for Wii Music; instead, you must use your trusty Wii remote and Nunchuk to make one of four motions: piano-type, guitar-type, trumpet-type or violin-type. These four motions work to play a variety of instruments in different music styles, but some are easier to pretend to use than others. While playing the imaginary trumpet I held the remote like one, pressing its 1 and 2 buttons like trumpet keys. But playing the piano uses the same motion as that which is used for playing drums — a downward hitting motion with the remote and Nunchuk — and this felt more like using a hammer than playing a piano. If you own a $90 Wii Balance Board, you can use it in drum mode in addition to the remote and Nunchuk. I tried this briefly, and it was fun to use the balance board in place of drum pedals. Wii Music isn’t meant to replace a music lesson, but it’s intended to get people thinking about music and their own music style, without fear of making mistakes. It’s fun, unintimidating and will even teach you a thing or two. Just steer clear of the Dog Suit, if you can help it. Discuss: Share reviews of videogames and systems in Journal Community.